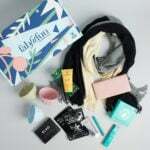 POPSUGAR Must Have is a lifestyle subscription box for women. Each month they send a mix of items from categories like beauty, fashion, food, fitness, and home. Each box comes with a fold-out card detailing the items included, and what themes inspired the box. The themes this month are floral, adore, valentine, honey, crush, and chocolate. This will be the last monthly box from POPSUGAR. Moving forward, they will send quarterly $75 boxes, with a value of $250+. If you want to continue your subscription at this new rate/frequency, no need to change anything. If you’d like to cancel, you can log in to your account and end your subscription anytime between now and April 15th to make sure you aren’t charged for this new box. This 8-ounce candle has a burn time of 60 hours and is made with 100% soy + vegetable wax blend. I love the sweet, floral scent, and the pale pink label gives it a simple and classy look, too. It’s a perfect candle for me. How gorgeous is this packaging? I don’t often think of hand cream as a great stand-alone gift, but this one is! The formula is rich, but not greasy, and it absorbs quickly. The scent is lovely and light, too. More gorgeous packaging from Toykomilk! On the inside of the label, you’ll see the Eiffel Tower! This scent is a blend of Mandarin, Tuberose, Gardenia & Vetiver. I’m not a perfume wearer, so this item is a miss for me, but it’s so pretty I might just leave it on display on my vanity. How adorable is this silver bud vase? I love that the design is perfect for Valentine’s Day, but also simple enough to work all year round. It measures about 5 inches tall and about 5 inches wide. The metal is brass with white or yellow plating, and there is one authentic diamond in the star. I love delicate gold jewelry, so this is perfect for me! Wow! These are fair trade dark chocolate treats made with honey instead of corn syrup, and they are gluten-free and all-natural, too! You get a chocolate + crisp rice crunch with a caramel center – delicious! Lastly, we have this Special Extra from Stella Artois! The set comes with a Valentine’s Day card if you choose to gift one or both of the glasses, and info on the cause. For every Chalice sold, Stella Artois and Water.org will provide five years’ worth of clean water for someone in need. The glasses each have a different etched design, with a gold-leaf rim. And my favorite part – they are dishwasher safe! Verdict: This box has a retail value of about $196.99! I think that’s an amazing value, and this is a perfect February box in my opinion – great for Valentine’s Day, but also any other day of the year, too! I will miss my monthly POPSUGAR Must Have Box, but they really ended their monthly subcription on a high note! Well done, POPSUGAR! Now I will anxiously await to see what’s in the first quarterly box! Can you still get this box if you sign up today? Yes, right now it looks like the February box will be your first box when you sign up. When you click “Subscribe Now” on the POPSUGAR site, the box your subscription will start with will be highlighted. What do you think of the February POPSUGAR Must Have Box? What’s your favorite item in the box? It feels like I have tried them all and I think that PS was the biggest disappointment. I got 3 or 4 boxes before cancelling. Rather than an exceptionally curated box, the products seemed like leftover promotional items (my daughter even said as much when she saw me wearing a scarf that had come in a PS box). One of the priciest out there and so totally not worth it. But hot damn, they know how to market. The boxes are great for storage though. Is there anybody willing to sell items from their box or swap for somethings from the Galentine’s GNI and GNO boxes ( I received #2)? I also have the Margot Elena Winter box and will be getting the Spring…. Any suggestions for a box that is monthly? I’m going to miss my Popsugar fix every month. Everything else I’ve see looks junkie or is very expensive. This is such a great box!!! Love this box and am really going to miss my monthly PSMH!! My son gave the candle and heart vase to his girlfriend for Valentines Day. The hand cream will be given to my other sons girlfriend. PSMH always has great giftable items. I am swapping both glasses and the perfume if anyone is interested. I to will miss monthly boxes. I’m on swap site . I also have the hair brush and poppy pattern travel bag that were add ons in January box 2018. I just don’t see them lusted on swap site. I am so dissapointed with the change. I love getting a box a month and when researching that’s why I picked this over like fab fit fun or others. Not to mention taking 30 something out a month is easier then 75 even if that’s quarterly. I’m going to cancel my subscription now. So so bummed I think that was a dumb move on their end. Just opened the chocolates. Yummy. Any ideas for the vase without fresh flowers? I want to try the hand cream but I am afraid it will be too strong of a scent? Anyone have a comparison to another brand? I can tolerate Bliss scents. Thanks. I must be the opposite of most of your readers. I found the FabFitFun Spring box spoilers to be super exciting, while everyone else seemed to think they sucked. I looooved PSMH while I subscribed (on and off) for about three years, but this box does nothing for me, except for the chocolates. I would have been so disappointed with this box, yet everyone here is over the moon! I just found it so funny how different my opinions are from this group. Beauty (boxes) is (are) in the eye of the beholder! Got my box yesterday. Wow- PSMH hit it out of the park with their last monthly box! The hand creme is one of the best fragrances I’ve ever tried, and the chocolates are so good, I’m going to buy a case of 6 packs with the coupon. And the candle and heart vase are both lovely. I really like the “chalices” too – they’re great for beer, wine, sparkling water, any beverage really. I sure hope this trend continues with the quarterly boxes. Anyone selling their February box? I’d be interest in purchasing a complete box. Thanks. Recieved my feb box today and love every item! Will miss my monthly treat! I love this box too! When I saw the spoilers I really didnt think I would like it, but I was totally wrong! The lotion and candle smell soooo good! This was my first Popsugar box and I am so sad that it wont be monthly anymore! I know I’m canceling mine because of that reason I want a monthly box. Very disappointed in them for doing that now I need to find a good lifestyle monthly box! PS I’m really going to miss your monthly box. The February box was amazing! I would love to buy another box. I’m excited to recieve the quarterly box. Just so you know, Pop Sugar has changed their box price from $39.95 to now $75. I think that’s awful. I hate that they changed now I have to find a new box. I did love this monthly box though sad it’s not the same. Has anyone else had a problem getting the margot elena promo code to work? I have been trying for an hour and it won’t work. I think I may have figured out why the chalices were included for free. Did anyone notice a misprint on the boxes? Both my boxes says 2018 when it should say 2017. I personally don’t care, but thought I’d mention it. @lizcadman, looks like the February box is sold out. PSMH boxes are going to be on sale on RueLaLa on Feb 4th…no clue which boxes..
hoping for some LE boxes I missed! no prob! hopefully some good boxes as it may be our last chance with the new quarterly PSMH…. have a great w/e Liz! Sorry it looks like the February box has now sold out. oh no! i contact them, they were amazing in december when I rec’d the wrong color necklace, I sent email and a new necklace just appeared days later at my door! This was a great box, but I have to cancel. I’m not into betting that a $75 box will be worth it for me. Even this one, that I love, I’d never pay $75 for. It seems that sub boxes are having some trying times. People used to enjoy getting new things to try, now everyone seems to want something for nothing. And I like the ‘trying stuff out,: but can’t justify $75 on one popsugar box to just explore things. So it goes..
the monthly PSMH boxes always worked out well for me as having kids def helps – what i may not like, one of them would always use – also, I would get full boxes for teacher gifts when on sale as hard to find such nice gifts at some of the old sale price points…. you are both right; too many sub companies and I can’t even imagine how much is spent on the endless complaints + wrong colors + other problems as the shipping alone is quite expensive! I only sub to PSMH and at times RZBOS and both have sent wrong colors, they should do away with choice if they can’t get it correct in 1st place! i’m all for choice but would rather keep cost down to consumers! will miss the monthly box for sure! Well, PopSugar comes through with another stellar February box and goes out on a high note. I received mine today and it’s so good! I was expecting a purse-sized tube of hand cream but it’s huge! The perfume is a bit heavier than my usual scent, but I will try layering it with a, citrus scent to lighten it a bit. The peony candle smells heavenly, the vase is beautiful and the honey caramels — OMG. Major self control required. OH– and those controversial Stella chalices. I’m a non-drinker but I love them sparkling water. The shape holds the bubbles really well. Love! This box is awesome. The vase alone is enough for me to want it. Honestly I love everything but the glasses (I still don’t like glasses that advertise products). Just ordered this. This looks like one of the best boxes I’ve seen in a while. I still have a couple of credits left on my monthly subscription. Does that mean I now get those in quarterly boxes instead? Yes. Each credit will count as $40 (price of former monthly box) so if you have two credits, they will use them for the $75 quarterly box. I’m not sure if you’d then be left with a $5 balance or forfeit it. Well, I have to say they went out with a bang, not a whimper. I liked almost everything in this box except for the perfume and everything was perfectly packaged, as usual. Now that this sub is over, I think we’ll come to appreciate (some of us belatedly) just how good it was month after month. Misses? For sure. But overall quality, variety and packaging — very consistently good! It was *always* fun to open up the box each month, and that’s saying something. Bye, PSMH. I may see you again 4x a year, but it won’t be the same. Does anyone have a recommendation for a monthly box in the $30 range to replace this subscription? Something that is not mostly makeup and not too young. I’ll miss the range of items Popsugar had. I would appreciate any suggestions! Thanks! Liz- it would be great if you would do a post on some of your suggestions! Someone else suggested California Found and I signed up last night after doing a little research. Looks promising. A little more “artsy,” as most items are from smaller, indie artisans, but the reviews I looked at showed a nice variety of product. Thanks so much! I will look into it! I find this really interesting. This box is a total miss for me, but most responders loved it. With 12 boxes a year, I was always totally fine with a box that was a miss for me because I knew there were so many more boxes that would be right for me. But, if 1 out of 4 was heart themed with flower scented items, I would cancel my membership. I hope PS steers clear of themes for their quarterly boxes and has a diverse set of items in each box. I will be gifting the items from this box, so it will still come to good use for me. And I think the glasses seem really cool. I just don’t need more glasses. I wish my box would hurry up and get here. I am excited for everything except the bracelet and the vase, will likely gift or sell those. Can’t wait for my chalices, don’t drink but thing they are beautiful. So glad I subscribed. I think I will hang on and see what the first quarterly box will bring.